A human skull that has been deformed. This is a Proto-Nazca skull from Peru. Skulls from the Paracas culture in the Andes. This is a photo of someone with the "Toulouse deformity". 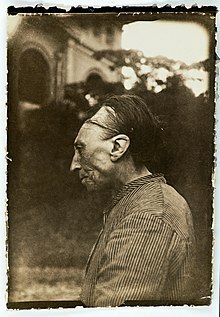 Artificial cranial deformation, also known as head flattening or head binding is when the skull of a human is changed forever, and on purpose. It is done by changing how a child's skull grows by putting force on the skull. Flat shapes, long shapes and round shapes can be used to do this. It is done on young children. This is because the skull is easier to shape at this time. Usually, the shape that will be used to change the skull is attached about a month after the baby is born. It stays on for around six months after this. The practice has been most often used in native societies in the Americas, but there are examples from Asia and Europe. The Toulouse deformation was caused by wrapping the head of the newborn, possible to protect it from damage. In pre-modern societies the practice was surprisingly common. In most cases the reasons for the practice is not known. ↑ Henshen F. 1966. The human skull: a cultural history. New York: Praeger.